Opioid growth factor (OGF) can serve as a new biomarker to determine diagnosis and progression of multiple sclerosis (MS), say researchers at Pennsylvania State University. Their study, “Serum [Met5]-enkephalin levels are reduced in multiple sclerosis and restored by low-dose naltrexone,” appeared in the journal Experimental Biology and Medicine. MS, an autoimmune disease that affects the nervous system, develops due to a disruption in communication between the brain and the body. 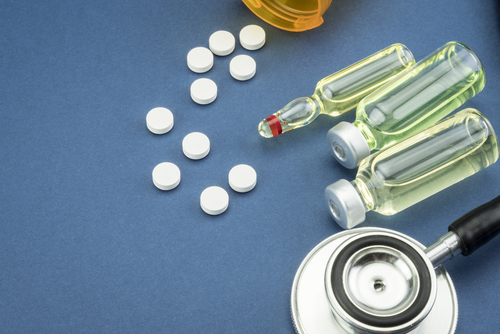 Doctors often prescribe low-dose naltrexone (LDN) off-label for a variety of autoimmune diseases, including MS. Naltrexone helps make MS more tolerable by blocking opioid receptors that regulate pain, reward and addictive behaviors. This causes OGF levels to rise. Studies show that treating MS patients with LDN improves their quality of life and reduces fatigue. But scientists have not figured out how LDN works in MS.
To find out, Penn State researchers examined serum OGF levels in MS patients and MS mouse models. They determined that MS patients have significantly lower OGF levels than do healthy people. Also, mouse models of MS have shown that decreases in OGF levels predicted MS disease development, and that treating MS-afflicted mice with LDN appeared to restore their OGF levels while having no effect on OGF levels in regular mice. The study demonstrates that OGF — also known as [Met5]-enkephalin — is lower in MS patients than in healthy people. It also supports the practice of measuring OGF levels in MS patients as a noninvasive biomarker. “Identification of OGF as a potential biomarker for MS supports our hypothesis for many years that the OGF signaling is dysregulated in MS patients,” Dr. Patricia McLaughlin, professor of neural and behavioral sciences at Penn State University College of Medicine, said in a press release. I would like to be in a trail study for this MS biomarker. I’ve been taking it for 2 or 3 years. I can’t go a day without it. The best/only treatment that really works for Myalgic Encephalomyelitis, which is “an autoimmune disease that affects the nervous system, develops due to a disruption in communication between the brain and the body”. I thank God my virus doctor, Patricia Salvato, M.D. prescribed it for me.